An alternative view on the Blues. After a pretty chaotic deadline day that saw four deals being completed, including one that broke Blues' transfer record, it's nice now to be able to take a breath and look at what we're left with. I've been pretty critical of many of Blues' targets this summer, but the player's we've actually signed have been very good, and I'm pleasantly surprised by what we're going into this season with. I'd rather us have done the business six weeks ago, but you can't have everything. Let's start with the positives of this window. Jota. Oh man Jota. A statistical beast (as one would expect at Brentford) but also one who looks pretty spectacular to the naked eye. Given that Britt Assombalonga cost a reported eye-watering £14m and £60k a week, the £6.5m for Jota looks a steal - especially given he's on the cusp of his peak at just 26. A versatile forward with a superb goal record from wide and number ten, a player who creates and scores goals from all over and in a position we've needed a player for a while. I'm also a sucker for a Spanish creator with a wand of a left foot, so from a personal perspective, what a signing. 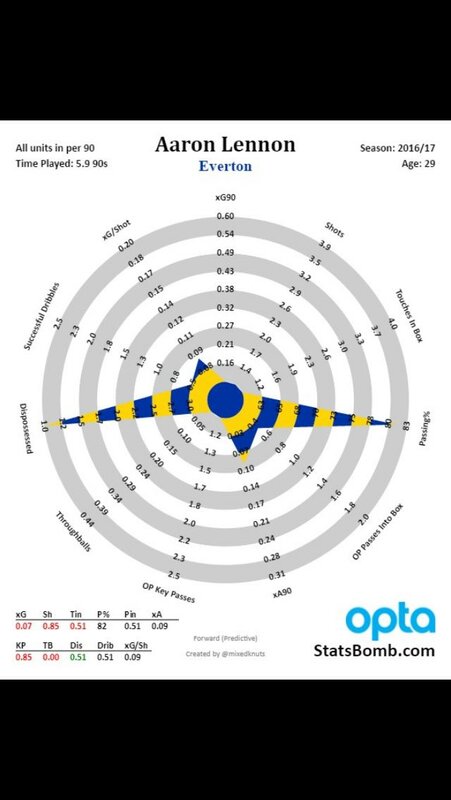 I don't need to dig into Jota's numbers too much because there's plenty of that around, but the headline number for me is 0.58 goals + assists per 90 minutes over his Brentford career. From wide or number ten who came into the league at 23/24, that's pretty spectacular. Isaac Vassell is another signing I liked, much like I liked the Adams and Stewart signings last year. It's a reasonable gamble in a market of absurd prices. With Adams, he was just £1.4m and already worth five times that minimum - so gambling on players like that is always worthwhile when top Championship teams will pay £10m for players with a few goals. Vassell is a great gamble, because he has really really obvious skills - his raw physical attributes are clear for all to see and if he grabs a few goals he'll immediately be worth more than he cost. The other Brentford lads look like genuine upgrades too - Maxime Colin I'm told is a very good attacking right back though I personally don't know much outside of what we've seen at St. Andrews. Harlee Dean similarly I've heard good things about, but given the competition is Michael Morrison, he's almost certainly an upgrade. I'll go ahead and put Marc Roberts in the plusses pile, as that struck me as a very good move. Tall, athletic and capable on the ball, Roberts looks like the real deal - at first. He's been a bit shaky so far, but I'm fairly confident he'll be good in time, and this is based solely on first impressions at the time of the deal. For that reason, I'll put Cheikh Ndoye in this list. Despite the fact it does go against some of my transfer principles, Ndoye was genuinely exciting as we needed to add midfielders to avoid relegation first and foremost. A player with a surprisingly good record from midfield for a player of his profile, Ndoye has had a mixed start at St. Andrews. A strong performance against Bristol City showed the plus sides of Ndoye - mobile, a good reader of the game, strong in the air and at times a threat going forward. However, his passing has been... hit and miss so far. But on first impressions, I liked it, and hope he can come good with good players round him. Selling Clayton Donaldson, as saddening as it was to see him go, was the right move. He's aging and looks a shadow of the battering ram who led the line under Rowett. He'll always be remembered fondly for the last few years, as a genuinely good Championship player with an incredible tolerance to punishment, pace and clever movement that allowed Rowett's teams to function. That said, now was the right time to move him on as we look towards Jutkiewicz, Vassell and Gallagher to be the ones leading the line. Let's move on to a few deals I wasn't too keen on. Shipping Cheick Keita out to bring in Cohen Bramall is absolutely ludicrous to me. Keita is a gifted full back with an uncanny ability to get out of sticky situations and a useful outlet going forward - and the idea that he can't defend to me seems entirely unfounded. He's gone out on loan to a Serie A team - Italy, famed for its hatred of defensive football. Bramall may well be a really good footballer - he may even be a direct upgrade - but assuming he is is insane. The kid has almost no actual experience and no games to base that opinion on, and not only that, won't be our player next year. Keita would be, and could improve hugely over a full season and give us a player of immense value. Hopefully, Keita will come back next year and be a Birmingham City player. I'm also very irritated about the sale of Maikel Kieftenbeld, an intelligent if limited player who was quite often the best midfielder in the side. Yes, his passing and first touch left a lot to be desired, but the way he found space in attack and closed it in defence was admirable - it's not his fault he was forced into a role where he had to create. I'd go as far to say as holding midfielders go, he was our best option, given his stellar performances there under Rowett which certainly dwarf Craig Gardner's recent attempts. I could accept it, had we signed an upgrade (such as Simeon Slavchev) which I think Song was supposed to be, but alas, that did not come off. Instead, we weakened the one position that we were most desperate to strengthen. That's the real disappointment of this window - but the most frustrating part is that it doesn't seem to be our fault (well, not entirely). We'd found targets, but hit snags on each one. Onazi couldn't get a work permit (which honestly reeks of incompetence on Blues' part, not the FA's), Acquah was forced to stay once Torino realised he was really good, which was odd, and Song we didn't want to pay the loan fee. The silver lining to the proverbial dark cloud is Liam Walsh, who at least sounds like the player we wanted. The fact that it's only a short term loan is frustrating, but indicates to me we'll go in for Song again in January (just a hunch). I'll happily admit I know very little of Walsh, but Everton fans adore him and refer to him as a player who can dictate games. The main gripe is the abundance of loan signings. It just screams short termism - yes, we have improved the squad, but if we don't go up this year (which is still really quite unlikely) we'll have paid a decent amount for these loan signings and have little to show for it. Sam Gallagher, for example, was not a deal I particularly liked. He looks like a better version of Jutkiewicz, which is handy, but it's a hell of a lot to pay for one year of an inexperienced if willing centre-forward with a not-too-exciting goal record. Carl Jenkinson was a legitimate upgrade, but without an option to buy, I don't love the deal. 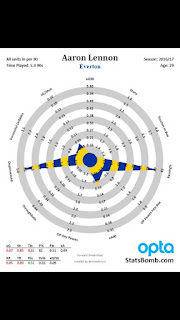 Jeremie Boga I liked a bit more, but that's mainly a personal bias towards players who can dribble. I'd prefer to get players in permanently, but finding them is tough. Jason Lowe, eh. Hard to have an opinion. Looks like a panic buy but on a free, relatively low wages I guess it could be ok. Not one I'm particularly excited by. David Stockdale, at the time I wasn't convinced about, as it seemed like a position that didn't need improving on, and I thought Stockdale would be on a fair whack. However, I was one of few Blues fans who wasn't that high on Kuszczak, who I've partially blamed for set-piece problems over the last few years as he doesn't command his area in the air and it leads to problems from wide set-pieces. Stockdale already appears to be better in that regard, his distribution seems far better and he's still a good shot stopper. At first, though, I wasn't keen. I didn't like selling Ryan Shotton, as he's a very good centre back and an underrated distributor, but there were rumours he wanted to leave, and replacing him with Dean and Roberts seems like a fine exchange. Whilst there are a lot of deals I wasn't crazy about, in the short term, Blues have the best squad we've had in years. My worry is if we don't go up, we'll need to spend again - but right now, we're good. The only issue is midfield, where if Ndoye doesn't start adjusting quickly we may struggle to get the ball into the quality we have up top enough. But my word, we finally have real pace and skill up top. Jota and Adams/Boga flanking Gallagher/Jutkiewicz, or Vassell and Adams up top with Jota behind, or Gallagher and Adams up top... there are genuine options up top for the first time in years. Jota being a left footed RW traditionally means he's the player we really needed to make the 4-3-3 work (even if I thought Kief was integral to that). Him and Adams wide with one of the forwards in the middle would genuinely be one of the best front threes in the league. The fact he can play centrally opens up the chance for the 3-5-2 to really flourish, as this gives us enough central presence behing him and can hopefully use Roberts' distribution from deep when we have the ball. I've been saying for months we need three in midfield, but with genuinely good defender we might be able to compensate by playing three CB's and using their distribution in possession and ball winning abilities out of it to compromise for the lack of quality. Alex Song would genuinely have been superb, and if we'd pulled that off, I might have been more tempted to tip us for playoffs. Overall, I'm pretty happy, and my god, am I excited for the next team selection. Harry Redknapp said today that Blues' deal for Ravel Morrison was 'probably dead'. Lazio wanted to offload him permanently but Blues were only willing to do a loan deal. The real question is, why were we ever in for him in the first place? Ravel Morrison is 24. He's no better than he's ever been and this is probably the footballer he's always going to be. If Blues knew Lazio wanted rid permanently, why did we ever take him on trial? He showed on trial everything we already know. He looks a nice footballer, with a delightful touch, ability to find space for himself and a great passer. But, crucially, he didn't really do anything of note. Yes, he looked nice. Yes, he showed glimpses of being a Premier League level footballer. But that's it - that's all he's done his entire career - well that, and get kicked out of clubs for non-footballing reasons. The outcry on social media has been... obscene. Blues fans have said Ravel is 'exactly what we need', called him a 'proven midfielder' and overlooked the fact that he's trouble - but not only that. He isn't a creative player. He created a goal less often than Andrew Shinnie in a Birmingham City shirt. He scored less often than Shinnie in a Birmingham City shirt. There's nothing outside of a Sir Alex quote from 7 years ago, and the odd shoulder drop to suggest Ravel could be anything like the creative force Blues need. Forget the hyperbole. Cut through the dense tweetstorm about how Ravel is the player Blues need. Let's deal with facts. Ravel Morrison got three assists in 2300 minutes at Blues. He has seven assists in pro football. He has 14 goals in professional football, three of which came at Blues. He's played 13 games in two years, without scoring or assisting. What are we so annoyed at? Even if you ignore the fact that he gets kicked out of any team he's at, there's nothing to suggest that Ravel Morrison would be a good signing. Even if you argue he's an improvement on our current creative options (which is a disservice to Che Adams, a better player at 21) that ignores the opportunity cost. Maybe Ravel Morrison is better than signing nobody - but signing nobody isn't the alternative. The alternative is signing a different creative player. Sadly, it's hard to back Blues to find a good alternative given they didn't bother to look at work permit laws, but Jon Toral is a better player than Ravel is. I've talked before about what I would do when it came to looking for players in Europe, so won't bore you with that. If we're paying Dein 25k a month, which has been quoted, and the best creative player he can come up with is seven career assists Ravel Morrison... well, I worry about our recruitment policy. Stop caring about not signing Ravel - there's hundreds of better footballers. Time travel seems to be in the news everyday at the moment. Whether that be Wayne Rooney going back to Everton, the unveiling of the new Doctor Who, or Harry Redknapp's transfer targets. Given the nature of this blog, I'm most interested in the latter, but clearly ol' 'Arry has been inspired by the new Doctor Who and thinks that time travel can be for anyone - especially footballers. That is if rumours are to be believed, of course. As has been suggested elsewhere, it's possible Harry is smarter than we think, misdirecting the public in order to keep schtum about the real targets. However, I'm here to break down why, unless it's 2005, we shouldn't be signing anyone we've been rumoured to be signing. Let's start at the back. Ashley Cole has been linked to joining Blues this summer on a short deal to bolster left back options. Redknapp seems intent on signing a left back, bizarrely, even though there were cries last year to play Cheick Keita, who was kept out of the side by the good form of Jonathan Grounds. Seemingly, Blues fans have given up on Keita ever being a good left back, despite him being fast, aggressive, good on the ball and an able passer, because he's had a few shaky games defensively. I think it's time we remember that Keita is very young. Younger than Che Adams. He's learning the language every day, as well as learning the game. Writing him off as incapable of defending because of a few shaky games (where, in my opinion, he wasn't even that bad) is really odd given the god-given skill he has. This is where we hear the argument that having Cole around would improve Keita as he can learn from him. A nice concept, but do you know what else would improve Keita's game. Playing football. Then we hear that Keita should play on the wing, but with very little actual reason why. Fans complained that Grounds wasn't good enough going forward, that he was too slow, his passing wasn't great, he couldn't create and so on. Keita brings all of that, and the same people decide he isn't a full back. So I ask: What do you want from a full back? Keita has shown nothing to prove he can be a real threat as a winger. He's looked best dribbling the ball from deep and overlapping. He seems very one footed and hasn't shown he's a reasonable goal threat from wide (much like someone else who we'll get to later...). He's a left back - a modern left back, but he's a left back. Ashley Cole is over 35 - he offers no long-term advantages, but would represent an outlay in wages. That is to say, if you sign someone of similar skill, but who is ten years younger, you can make money back on that investment. In a years time, when we come to the next transfer market, we're left in the same position; unsure of whether or not Keita is good enough and a few £100k down. Giving Keita the minutes that Cole would take is a better decision for three reasons: a. Keita will improve with time. b. Keita is fitter, and more capable of playing those minutes c. Keita is more likely to be a better player by next year and worth a decent chunk of money, as well as saving the wages for this year. The only disagreement would be if you think that Cole playing ahead of Keita for 15-20 games a season would make a serious difference to whether or not Blues go up. I don't think we have much chance of going up this year at all anyway, and as such long-term planning makes much more sense. Robbie Keane, similarly, is old and not an improvement. Yes, maybe he'd be good off the bench for 15 minutes. But when Blues fans complain the squad needs improvements, should we be looking for back-ups? Surely we should be improving the first team, and making the current players back-ups? It's a sunk cost, money that could be used on a gamble with long-term upside rather than short-term upside. Use the money for his wages on a young forward who can improve, who, at the end of next year, we aren't looking to replace again. The next player is Aaron Lennon, who has today been linked. If we ignore the concerns about his health (and truly, I wish him all the best), I still would not want Blues to sign him. He's a player who was so incredibly reliant on his pace and ability to go past people, and he can't do that any more. Credit to Ted Knutson for the image, the image which shows that in his limited minutes, Lennon did the sum total of... absolutely nothing last year. Again, he had health concerns and injury problems which caused it, but why take a gamble on a 30 year old getting his pace back, on loan? What's the upside? Stewart Downing is the best of the four linked. He's a decent enough player, still relatively quick, a decent passer and a pretty clever footballer. However, he's on the way down, he's not played regularly for a season, and isn't getting any better. Also, if you want to go up, seems odd to take a player that your rivals realise isn't good enough for them. Some will read all this and ask who I would sign, but that isn't really the point. I'm not a professional scout, just a bloke with too much time and too many opinions. I'd be looking abroad. Austria has shown there is plenty of untapped talent over there, with Liverpool star Sadio Mane and Leipzig player Naby Keita plying their trade over there not too long ago. Serie B has a host of talent, and I've been closely following a few names to see where they go. Ambitiously, I'd love us to try and convince Amato Ciciretti, or Camillo Ciani, to come, though they seem likely to be going to Serie A. There appears to be some snobbery about signing from the second division of other European countries, as if we're not also a second division side. The reason I'd be so keen to look abroad is that signing from within England has become an incredibly expensive business. TV money has leaked into Championship prices, with top Championship players going for £10m+, whereas the top of La Liga B, 2.Bundesliga and Serie B go for a relative pittance, meaning that Championship sides can find some edges there. Planning for the short term is a recipe for disaster, and the best run clubs sign as much for the future than any others. Planning for the short term leads to Sunderland, Aston Villa, Fulham-style falls, and signing aging players is the biggest part of that. Look to the youth. Plenty has been said about the sacking of Gary Rowett and the subsequent hiring of Gianfranco Zola, but I won't cover that in much detail. I understand the reasoning for firing Rowett and, even though I don't like it, I see where TTA are coming from. Instead, I'd like to focus on football, and why yesterday's tight loss to Brighton was actually really quite good. First off, Brighton are really good. They're second in the table and they're miles better than anyone other than Newcastle. They have and will beat better teams than Blues. Blues restricted them to their average of 13 shots, four on target, but of those, only two were inside the box with feet, which I don't need to tell you is the most dangerous shot to concede. Sadly, one of them was rifled in by Anthony Knockaert. That is a little unlucky. Glenn Murray scoring is something that happens a lot in this league, and yesterday it happened to come from a set-piece in the last minute. 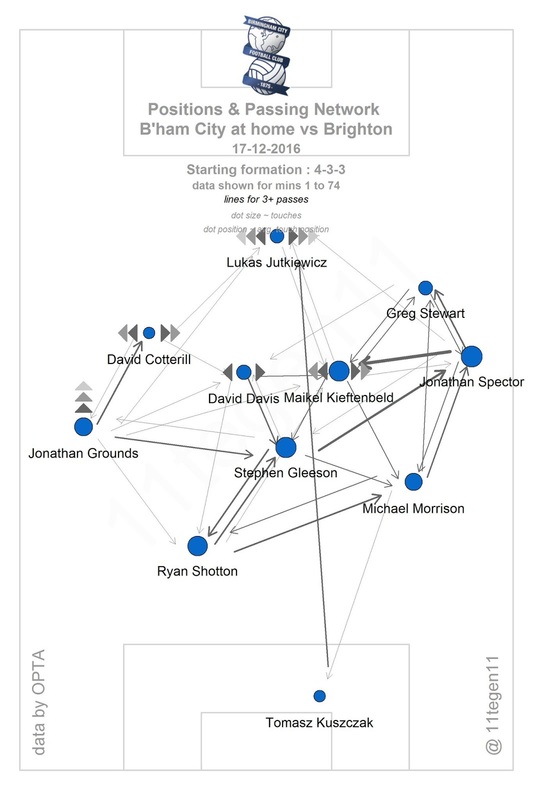 It's gutting, but Blues were hardly cut apart by Brighton like at Newcastle. In fact, this chart from @11tegen11 would suggest that Blues were extremely unlucky to lose this. Brighton taking two half-chances is just unlucky, and to suggest that Rowett's Blues is somehow impervious to bad luck and would have won that, as I have seen from some Blues fans, is a little silly. I understand the upset, but it's not Zola's fault that our luck is starting to swing. Even the most hardened Blues fan will tell you that they've been a little fortunate in recent weeks; it seems odd to praise Rowett for Kuszczak having three blindingly good games in a few weeks and yet when those shots go in, it's somehow the manager's fault. So how did Zola go about it? Blues kept the ball much better than in previous weeks and this helped alleviate some of the pressure put on the defenders. This allowed Blues to restrict the opposition from shooting far more than under Rowett, as quite simply, they had less of the ball. Brighton are where they are because they can and do take apart set defences, and Anthony Knockaert especially is fantastic at it. Newcastle are similarly good, and we saw what they did to a Blues side who sat back and tried to soak up pressure. It wasn't until the subs came around the 70' mark that Blues started to sit back and Brighton, as you can see from the above chart, started taking shots and creating, but they hardly took Blues apart - them converting the chances blinds people to that. Blues lined up in a 4-3-3, and passed the ball much better than in previous weeks. There was a clear structure and plan in the passing and Gleeson got on the ball far more than in previous weeks. The worry here is how much came down the right hand side, though generally this shows a clear plan and that Blues are able to pass the ball and create a nice network of passing. David Davis appears to be the weak link here. Where Kieftenbeld created triangles between Stewart and Spector, as well as the midfield triangle, Davis couldn't affect the game as much on the ball. That said, his pressing and tackling ability in midfield can be key and it was he who won the ball back for Kieftenbeld's early chance. The full-backs played extremely high up the pitch, which was a change too, and we shall see if this continues. Jutkiewicz is impressive in this chart, as he consistently found himself linking up with team-mates as a target man should. What does this all mean? It means that this, despite the disappointing result and the frustrating way it occurred, was actually pretty good. Some fans will blame Zola's subs - which is fair enough, but I would counter that a Rowett side would have sat back and been beaten earlier in that game. Brighton are really, really good, and Blues restricted them to headers and awkward shots, which is about as much as you can ask for. Blues' lucky streak has started to swing it seems, and that isn't Zola's fault. This leaves us with January - and I have no idea what will happen in January. I think Zola may try to bring in a midfielder or two; I can't see him persisting with Davis in every game. Another forward appears likely, what with Donaldson's long-term injury and advancing age, and wide-left is a strange position. I don't know if that's where Fabbrini will play - given how narrow Cotterill was, I wouldn't be surprised - or if that's a role for Adams, or maybe Cotterill is the long term plan there. In conclusion here, Zola's Blues were good but unlucky, we passed the ball a lot better but sadly got bitten by a bit of bad luck - so let's not that fuel the narrative. Back Zola, and who knows, maybe we'll be pleasantly surprised. It might even be better than under Rowett, the truth is none of us know at this moment in time. As always, @BCFC_RYB or @ElliottBCFC on twitter, and a big thanks to @11tegen11 for the use of his data vis. 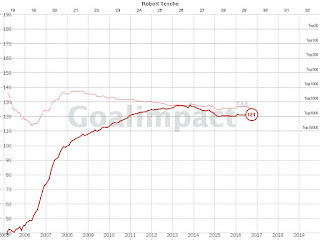 Robert Tesche - A Game-Changer? Much has been said about Stephen Gleeson and his role in the Blues team. Some Blues fans don't rate him, some will defend him to the hilt, some take a moderate view. I think all of them have a point, and even as a fan of his, he is underwhelming at times. That said, he's been a big part of a midfield that has helped revive a broken Birmingham side and his passing range is, at times, astounding; though maybe not as often as we would like. In the summer, Rowett added Robert Tesche to the ranks after a successful loan spell at the back end of the 2014/15 season. In the three games he has started this season, Blues have put in three superb performances and I wanted to look at how much Tesche affects the teams he's in. According to expected goal data, which attempts to subjectively measure how good chances a team creates are, the three games against Norwich, Fulham and Reading (in which Tesche started) were three of Blues' best. A 3-0 win against Norwich was backed up by a healthy 2.24 'expected goals' to Norwich's 1.52. This at the time was one of Norwich's poorest attacking performances. I covered the Norwich game and the tactical side to it in my last post if you would like to read about how we stopped them playing. This was followed by a dominant performance that led to a 1-0 win away at Fulham, where Blues missed a penalty and a series of good chances to make it more comfortable. Blues pressed incredibly well and the second penalty was won by Che Adams stealing the ball on the edge of the Fulham penalty area. Expected goal data had it as a 3.54 - 0.97 Blues win. The third was a 0-0 draw against Reading. Blues were once again dominant, this time with Jutkiewicz up top who doesn't press as well as Donaldson necessarily does. Jutkiewicz had five shots, four of those inside the box and didn't manage to convert any of them, but expected goal data was once again impressed with Blues. Since then, Blues haven't created over two expected goals in 90 minutes, and Tesche hasn't started a game - obviously this is a small sample, but it's hard to deny Tesche's influence. To prove it, I took a larger sample. In his first spell, Birmingham bagged six wins, three draws with only three losses in twelve games, but it's hard to compare that with anything given the shambles that came before it. So I had a look at Nottingham Forest and found an interesting pattern. Last season, Tesche started and played over 45 minutes in 16 games for Nottingham Forest. In those games, they averaged a goal per game, conceding just 0.69 goals per game on average, and took 1.56 points per game. They lost just three of those 16 games. In the games Tesche missed, they averaged 0.88 goals per game - not much of a drop, around six goals in an entire season. However, they conceded 1.42 on average, a huge increase; worth 33 goals over an entire season. That suggests had Tesche played for a full season they would have been 39 goals better off than had they not had him all season - obviously this is a massive stretch, but it's hard to completely disregard his impact. They were also 0.6 points a game worse off without him. Okay, so you could argue that they didn't have a good replacement for him. This year they let him go, which would suggest they thought they did have a good replacement. They are scoring more, at 1.56 goals per game, 0.56 more than with Tesche in the side the year before; but it's a double-edged sword. They're conceding 1.88 goals per game, a huge downgrade on 0.69 goals per game. They're averaging a point so far this season, too. That's a 26 point difference. Clearly this is very rudimentary - form swings, averages stretched over a season on a small sample can bring wild, wild differences from reality and Forest's squad is much different to what it was - but that is such a huge difference that it's quite tough to suggest Tesche has no effect. It's hard to compare Blues with/without Tesche as he's only started three games, but those three were three of Blues' best performances of the season. He allowed Blues to press more aggressively as he is more mobile than Gleeson and intercepts the ball extremely well in advanced positions. He appears to get forward more often and his movement into the box has been great in limited minutes this year. I'm loathe to draw sweeping conclusions from this, but I thought that Forest's dip in performance without Tesche was interesting enough to share with you all. As usual, @BCFC_RYB and @ElliottBCFC on Twitter for all your complaints! EDIT: Robert Tesche achieves a 121 GoalImpact rating, which is a measure of how much better a team is when a player is on the field. This is about the level of a top Championship player, and importantly is much higher than the average Birmingham player, at around 112. 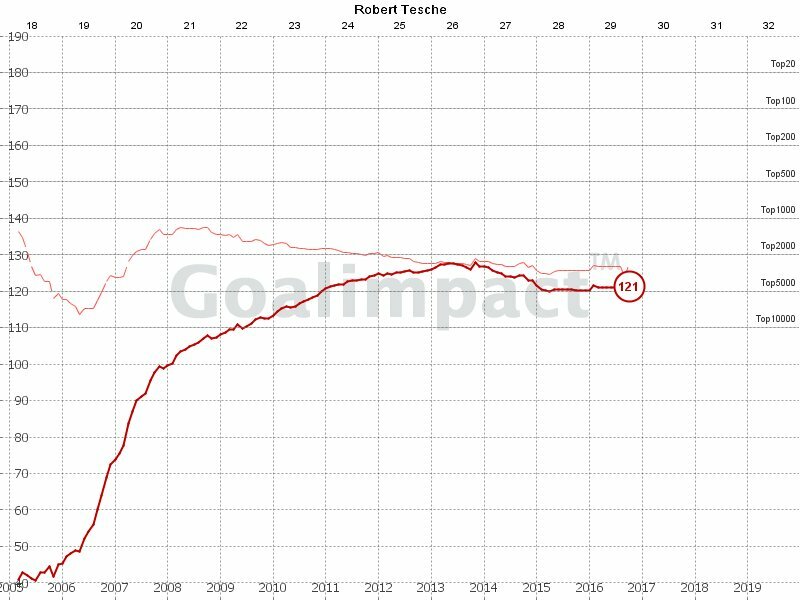 I recommend checking out goalimpact.com for more on what that means, but it's another statistical indicator that Robert Tesche is a huge upgrade on the average Blues player. The highest average GoalImpact rating in the league is Newcastle's, at 124.7, which makes Tesche likely a top end Championship player. A change in system saw Blues run out comfortable winners over Norwich, as Gary Rowett's 4-4-2 took Norwich by surprise and exploited a few weaknesses in Norwich's defence. This was a far cry from the Wolves game, in which Blues were crushed in their own deep block and failed to get a stranglehold on the game. I'm going to look at what worked and what didn't. I was quite vocal on twitter about Davis' performance in the Wolves game. He was incredibly poor in that game, but I don't think that's his fault. He has a specific set of skills that really suit a pressing game, which is why I actually think he's a decent winger in certain situations. 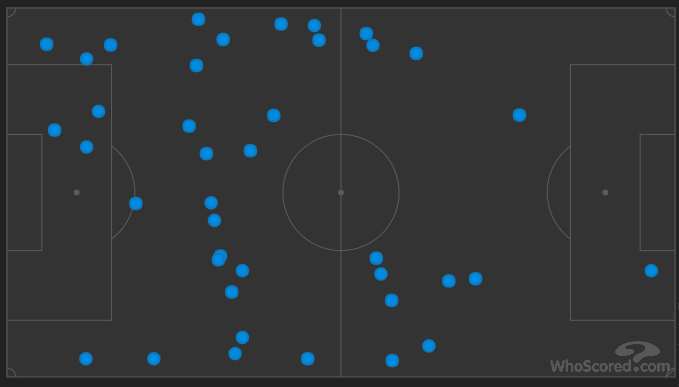 That said, in the double pivot at Wolves his eagerness to press and lack of composure on the ball really showed up. Blues were forced to go long due to Davis' resistance to dropping deep to collect the ball. Davis touched the ball just five times in a central position in Blues' half - Gleeson around 10 or 11, which still isn't good enough, but it's better. More importantly, he was defensively slack. A lot of Wolves possession came in Blues' left halfspace, which should have been his responsibility as the left-sided DM. 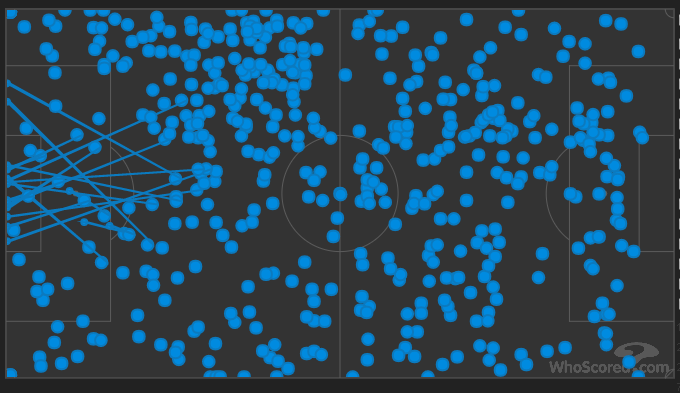 It's clear looking at touch-maps (below; Blue represents Wolves touches. Wolves attacking towards left) that this is where a lot of Wolves' joy came and allowed them to put pressure on Grounds and Shotton on that side. Davis attempted just one tackle in this area, and he was the only one to make a tackle there. Now, against Norwich, he played in a system which suited him. Rowett decided to press aggressively, which was especially useful with Cameron Jerome out, as it meant Norwich couldn't play a long ball over the top in order to evade the press. This pressing system suited Blues wingers down to the ground - I've long admired Maghoma's defensive abilities - and Blues won the ball 12 times in the Norwich half, three times as many as against Wolves. Davis often instigated the press and Norwich struggled to get past it, relying on Tettey to be the dictator. An overlap into the Davis chapter, but Tesche and Kieftenbeld dealt with Hoolahan very well. Hoolahan is an incredibly dangerous player if he can get into 'Zone 14', the space just outside the edge of the box. Tesche and especially Kieftenbeld stopped him getting into that position where he can hurt Blues. Norwich managed to get so far but appeared to hit a wall. Predictably, Blues had issues in the half-space on the other side, however in a 4-4-2 with pressing wingers that's where the space will be. Norwich gave the ball away many times in the right half-space and as such, Blues were able to win the ball back nearly twice as much as against Wolves. Tesche and Kieftenbeld were also more comfortable in playing possession football when we needed to and broke forwards from midfield well - including one instance where Tesche really should have scored. Che Adams has made a big difference already. Despite playing in a similar position, he's a very different proposition to Diego Fabbrini. Interestingly, against Norwich, he stayed central and Donaldson shifted out to the right a lot, making a sort of 4-3-3 at times. Donaldson has benefitted most from Adams' ability to press defenders, turn and run at defences and occupy defenders. Donaldson looked much more like the player he was two years ago, as he sprinted past Norwich players, was a physical presence and a goal threat. Adams collected the ball in central positions in the opposition half 13 times against Norwich, where he can run at defences. His pace and strength are incredibly useful in holding off defenders and makes him and Donaldson a nightmare to play against. According to Expected Goal data, an objective measure for measuring quality and quantity of chances, Blues attacked Norwich better than any other side in the league. Blues created an 'expected' total of 1.7 goals, including the penalty, which is more than Norwich conceded in the first three games put together. Given Donaldson created Tesche's chance, won a penalty and then scored, it's fair to say he was a big part of that. It's entirely possible this total is conservative - Tesche's chance had only a 63% chance of being converted according to location and angle, but this doesn't take the speed of attack and position of defenders and goalkeeper into account which would likely make it a better chance. Similarly, Adams' one on one from a tight angle. It's difficult to make conclusions from such small samples, but Blues were demonstrably better against Norwich. On the other hand, that system won't necessarily work against every team. I would, however, play the same side against Fulham, whose left back is particularly dangerous. It's well documented that Fulham have made the most passes in the league, so maybe going and pressing them will be dangerous as they may be best placed to dodge it. I would still try it, however, as Matt Smith will hurt us if we try and play deep, as Fulham will be able to hit him directly. 4-4-2 seems to suit us but I wouldn't rely on it in every game - but Che Adams has to play no matter the system. There's been a lot of anger aimed at the club and Gary Rowett, due to the perceived need for a centre-forward - which appears to directly contradict the clamour for Jack Storer and in some corners, Ronan Hale, to get game time. However, I'm going to make the case against signing a centre-forward, though I'm aware it might be controversial. 1. Donaldson is actually pretty good. Let's start with the football side. Clayton Donaldson is a lot better than a lot of fans seem to remember. Yes, he doesn't score loads of goals - but 10-15 goals, or 0.27 per 90 as I prefer to use, is pretty damn solid in a team not set up to exploit the centre-forward in terms of goals. There is a reason that all of the attacking midfielders who got significant minutes took more shots than Donaldson per 90 minutes. Jon Toral was a more consistent goalscorer, David Cotterill scored at 2/3's the rate of the Jamaican international and Maghoma at the same rate. What does this mean? That unless Blues change the way they attack, the striker isn't going to get 25 goals a season. Much of the striker's job in this Blues team is as a facilitator, a creator and a link-up man. Many Blues attacks start with a direct ball to Donaldson who finds a winger or attacker and push forward. He is, essentially, the quintessential target man. It's entirely possible that we could improve on Donaldson, but it's also quite unlikely for the money we have. Donaldson, were he for example 27, would be worth £3-4m. A player with 0.49 goals + assists per 90 in over 3000 minutes, as well as his ability to link attacks and set off counter-attacks. How do you improve on that for £1-2m? The answer is through smart scouting and youth development. Blues cannot compete financially with the top 10 in this league. Everybody knows that. That means we're probably not going to go up this year - which would make spending money on a striker who might score another four or five goals this year a waste of what resources we have. In order to be able to compete with them you need to consistently raise funds by buying under-valued players and selling them on, turning our limited resources into larger resources so we can make a proper promotion bid in the long-term. Ask yourself - which players are worth the most in today's market? Young, British talent; goalscoring wide players; and centre-forwards, are always worth more money than their counterparts. If Jacques Maghoma scores 15 goals next year, his price would skyrocket - a 28 year old, playing in England, with 15 goals from the wing would cost around £4m in theory if you buy from a top half Championship club. Derby paid around £6m for Tom Ince, who scored at around 0.33 times per 90 last year, though he is younger and English. Centre-forwards who score goals are very, very difficult to get for cheap. Blues are a team that is set up to give wide men space to attack - so the smart thing to do, economically, is sign cheap, or under-priced, wide forwards and hope they multiply in price. That's why I love the links with Che Adams and Greg Stewart. They make so much sense in footballing and economic sense. If Che Adams has a decent year, his price will double. If he gets 20 goals over 2 years, he would be worth 5 times the price we pay for him. He's fast, versatile, English, young and scores goals from wide. £1.7 or £2m sounds like an absolute steal, because even if it goes wrong you won't lose much. Greg Stewart is older, and not English, but he's at the peak age, and should be worth more than £500k. This is a guy who scored or assisted 0.67 times per 90 in, albeit, the Scottish Premier League, from wide. It's a gamble from Blues, should they sign him, but one that makes sense. If he has a good year or two, scores a few goals - he'll be worth a lot more than that. You can sell that and then re-invest in similarly under-valued players. That's how you make enough money to compete. The final point is the emergence of Jack Storer. It would make sense to give him game time as soon as possible, and signing a striker will only limit that. Storer is 18, and has impressed everybody in pre-season - it would only be fair to let him play at some point at the start of the season. As I've said so many times, young, English goalscorers are worth a LOT of money. He would only have to score a few times this year to be worth a few million, and if he's as genuinely good as Blues seem to think he is, he will be worth more than our entire squad in six months. Playing Storer makes so much sense for the long term future of the club. Either: He is good, we mould him into the perfect forward for the team and we have the striker we've been looking for without spending much money; He is brilliant, and we sell him for £5m+ and re-invest, improve the squad and improve, slowly but surely; or he is not all that great and we lose... nothing. It's low risk, very high reward. In summation, Blues aren't going up or down this year, so improving the squad a small amount doesn't really make that much sense. Instead, it makes sense to play young players (Solomon-Otabor, Storer, Brown) and sign young or undervalued players to sell on (Adams, Stewart) and build for the future. It's what Southampton do, it's what Dortmund do, it's what Brentford do (one of the lowest wage budgets, but consistently in the top half) and I think it's what we should do. Rowett is a smart guy, and I'd trust him to buy smartly and have a long-term plan; I just hope the young players get the minutes they need to improve this year - more important than signing a striker, for me.